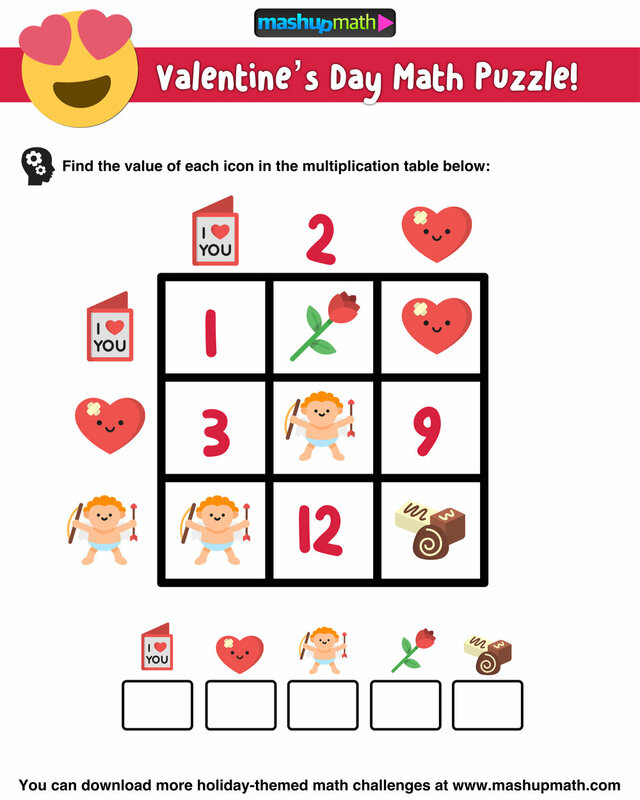 Are you looking for some fun, free, and printable Valentine's Day Math Activities to share with your kids this month? Holiday-themed math puzzles give your kids an opportunity to think critically and deeply about mathematics, develop problem-solving strategies, and work through challenging problems. And when math problems can channel your students' excitement for Valentine's Day into meaningful learning experiences, engagement will skyrocket! So, go ahead and try these challenges and puzzles with your kids this month. 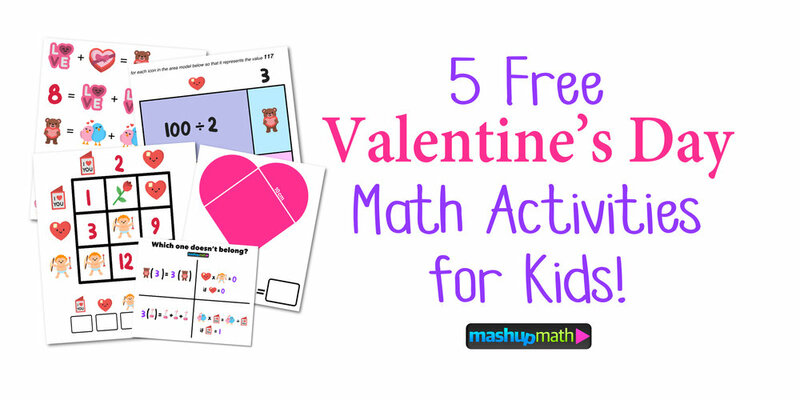 These free and printable Valentine's Day Math activities are perfect for warm-up and/or cool-down activities and are great for sparking mathematical discussions in your home or classroom. The puzzles are perfect for students in grades 1 through 8. How to Download: You can download any of the puzzles by right-clicking on the image and saving it to your computer or by dragging-and-dropping it to your desktop. Hint: 8 minus what value is that same value? 2.) Multiplication tables work like a Bingo board, where the value of each box represents the product of its corresponding row and column. Remember that WODB? activities are meant to spark mathematical thinking and discussion and do not have a single correct answer. Using area model challenge questions is a great strategy for getting kids to think visually about multiplication, which is the approach that Mathematical Mindsets author Jo Boaler recommends most for improving math understanding. Hint: The area model represents the product of 13 and 9. Can your kids use their knowledge of area, perimeter, and composite figures to solve this puzzle? Hint: Two half-circles makes one full circle. Do you want to get free math puzzles like this in your inbox every week? Click here to sign up for our free mailing list (includes a free eBook!). 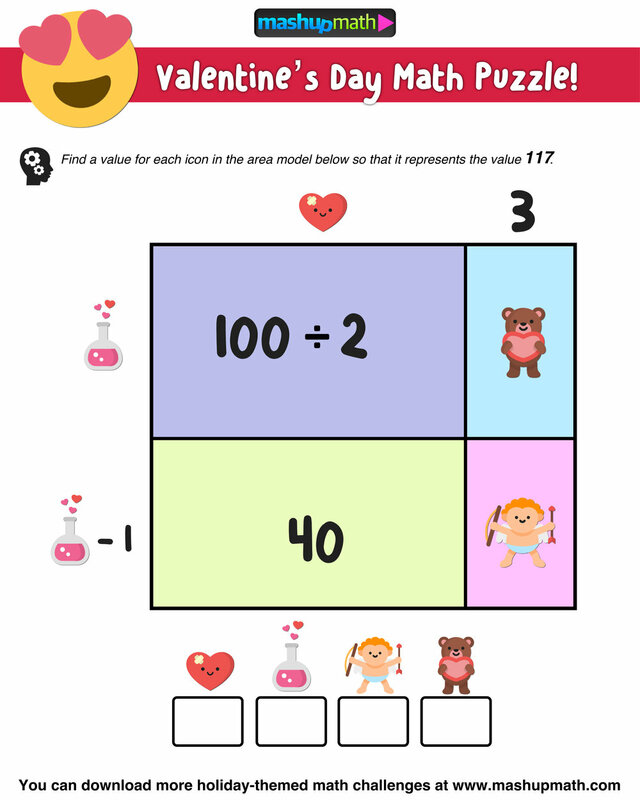 How will you use these math puzzles with your kids? Share your thoughts and suggestions in the comments section below!